ChocsforChance 2016 – a unique chocolate opportunity. 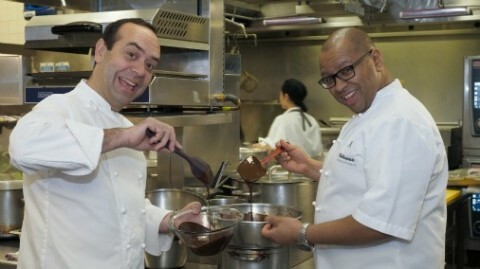 Many of the countries greatest chefs are creating exclusive boxes of chocolates for you to bid for. I know that if you are reading this you aren’t someone who needs much persuasion to seek out fantastic chocolates. And Valentines is just the kind of slight excuse you won’t even need. But who knows, maybe you are doing a New Year’s detox, or some such foolish thing. Or maybe you aren’t loved up at the moment and so February 14th is set to be ignored. Well as to the former, I have already said, foolish! And as to the latter, there is no better person to buy a little love for that yourself. At least if you buy yourself some chocolates you know they will be fully appreciated. But just in case you needed that extra push, from 29th January, for ten days only, you have two extra reasons to get serious about chocolate. Two of the best reasons that I can think of. An amazing cause, and world class unique boxes of chocolates. Chris Galvin and Fred Sirieix at Galvin’s Windows restaurant. 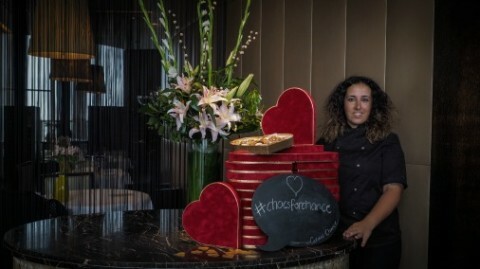 Galvin’s Chance, the charity which aims to help disadvantaged young people to turn their lives around through work training in the hospitality sector, is running the Chocs for Chance auction. 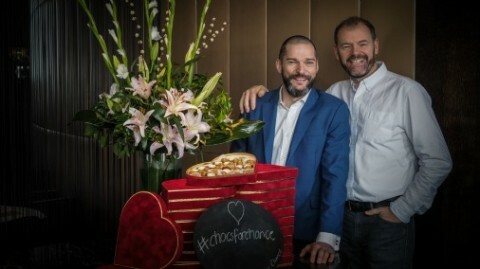 Established by Chris Galvin and Fred Sirieix, Chocs for Chance has a plethora of culinary gods creating one-off boxes of chocolates to be auctioned in aid of the charity, and ready for delivery in time for Valentines day. 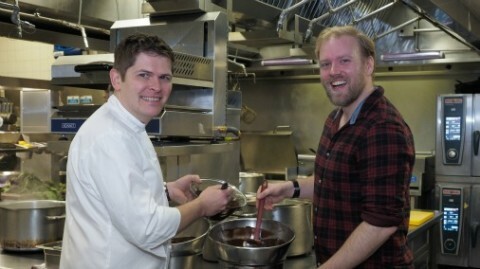 A culinary dream team – some of the chefs whose chocolates you could bag! 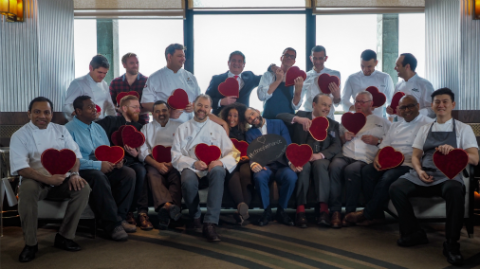 Last Monday, the incredible line up of cooking talent that assembled for the photoshoot high above London at Galvin’s Windows restaurant, represented just a portion of the full compliment of chefs. Add to the mix Raymond Blanc, Tom Kerridge, Marcus Wareing, Phil Howard, Atul Kotchar, Nuno Mendes, Nathan Outlaw, Michel Roux Junior…..I could go on. You get the picture. Some of the chefs are being extra generous. The lucky winner of Jeremy Lee’s glorious sounding chocolates – marzipan stuffed Agen prunes dipped in Cru Virunga and topped with Marcona Almonds – will also win a voucher for a three course dinner for two including a bottle of house wine. The majority of the chefs involved are not specialist chocolatiers, and their excitement about focusing on this delicious medium and creating something truly worth bidding for is palpable. And with Valrhona as a sponsor of the event they have plenty of great tastes to play with. Jose Pizarro lit up when I asked him about his creations. With an array of Spanish flavours, of course, it will include orange, passionfruit, Arbequina olive oil and quicos, a traditional corn snack. They all sound gorgeous! 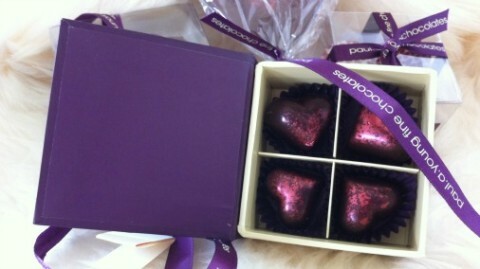 All the chocolates will arrive is the special velvet Valentines boxes that have been designed for the event. How wonderfully, date-appropriately louche! Christophe Gasper and Kevin Lopes of Sketch. Christophe Gasper and Kevin Lopes, chef patissiers from Sketch, are making a trio of classical sounding treasures – whiskey, red fruits and hazelnut gianduia. 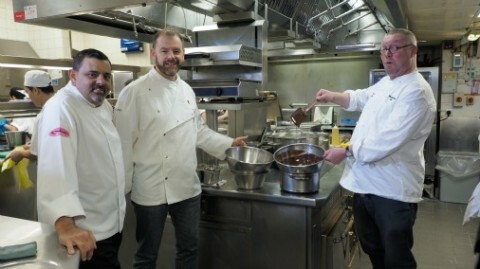 Chris Galvin gets chocolatey with Cyrus Todiwala and Fergus Henderson. While Cyrus Todiwala is sticking true to his roots and will be beguiling with cloves, cinnamon, red chilli and aniseed. Matthieu de Gottal, and some serious whiskey from Compass Box. There are a few chocolatiers in the mix, bringing their honed skills to the challenge. 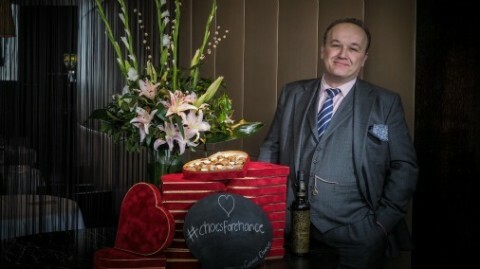 One such is Matthieu de Gottal, whose Flaming Heart chocolate is exclusive indeed. His expertise with whisky is renowned, and he will be creating a Scotch Whisky water ganache using Flaming Heart – a 15th anniversary special edition from Compass Box Whisky Co. A Scotch aged in new French Oak, with the peat-fired smoke of Islay malt, this is a whisky to savour and celebrate, and if anyone can create chocolates to do it justice, Matthieu can. He has combined it with an Organic 55% Dark Milk Chocolate from Fazenda Sempre Firme in Bahia in Brazil. Wow! Stuart Heritage with his right hand man for the occasion, Luke Frost. Getting in on the act by virtue of a bit of technical assistance, in the form of Valrhona pastry chef Luke Frost, the Guardian’s Stuart Heritage has devised a deliciously quirky box of delights. Cheekily titled Breakfast in Bed – a bit of hopeful thinking there for Valentines morning- the chocolates are twists on breakfast favourites. Cereal Milk is a white chocolate ganache with the crunch and infusion of comforting cornflakes. Hazelnut Spread evokes our favourite toast topper and uses a new Valrhona couverture that includes 12% hazelnuts and yet can still be tempered. And I was lucky enough to have a preview taste of Toast & Marmalade – a Caraibe dark chocolate ganache with hints of orange and tea, and its essential crunch in the form of a toasty coating. It was quite delicious. And won’t make nearly as many crumbs on the bedclothes as the real thing. 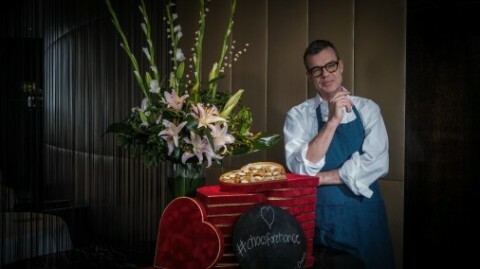 If that wasn’t enough Stuart is offering a trio of other prizes to choose from – including himself as a lunch date at Galvin’s – to further tempt you to bid high. 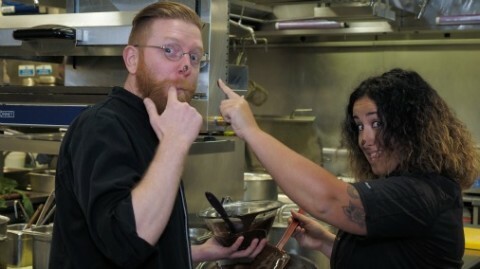 Paul A Young swaps tips, and chocolate, with Carla Henriques. Carla Henriques’ offering includes her signature ‘rolos’ in seven flavours – roasted salted peanut, passion fruit, rum, pecan & bourbon, malakoff, raspberry and salted caramel. Yes please! And the lucky winner will also bag dinner for two at any Hawksmoor restaurant. No stranger to chocolate, the brilliant Paul A Young is guaranteed to be fielding a box of absolute beauties. 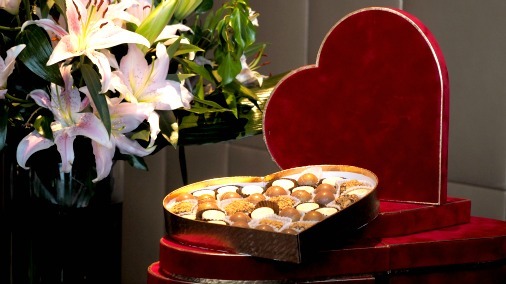 With his mad skills you can be sure that his heart shaped chocolates will be heart-stoppingly pretty. Pretty enough to win over any heart you want them to. And with raspberry, rose, cream cheese and salted caramel hearts as his exclusive for this year’s Chocs for Chance, they are going be be truly yumptious too! Paul’s Valenties collections will be in store from the beginning of February. If you don’t get lucky in the auction, or if your luck runs out before you have enough chocolates to satisfies multiple paramours, then it is worth remembering that Paul has lots of very fine offerings in his shops this February. The filled chocolates will be an update on his mini-breaks collection. Evoking romantic breaks at destinations around the globe, the flavours are inspired by international cities. For example The London is a wittily tasty take on a gin and tonic. So, put the 29th in your diary, and prepare to get bidding. If you want to know more about Galvin’s Chance, the auction, the chocolatiers and all the treats they are offering, check the Chocs for Chance website. Last but not least, if you want to contribute in more ways than one, Fred Sirieix is designing his own special box that will be available by an online raffle. So, for the small price of a tenner, you can buy a ticket and you might get lucky this Valentines and win Fred’s chocolates and an accompanying bottle of Pommery.